I am excited to report that EdCamp Louisiana 2011 is underway. EdCamp is an UnConference built around the wishes of its attendees. The sessions will be catered to what the audience wants to see and hear. The presenters will be Professional Educators who are knowledgeable about a topic or willing to experiment and learn about the unknown. We have an evergrowing list of attendees and presenters. We are creating flyers for advertising purposes. We will soon have a website up and running as well as a Paypal Account to handle donations and sponsorships. Read this blog post by M.E. Steele-Pierce, Unconference: Revolutionary professional learning for more information about the UnConference concept. Dr. Steele-Pierce is Assistant Superintendent for Teaching & Learning at West Clermont Schools in Ohio. Her post defines the concept of EdCamp, the unconference, and its value as a way to disseminate needed (and wanted) information. 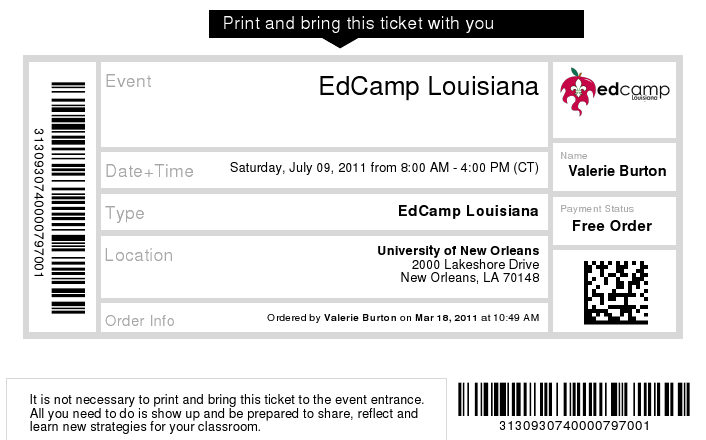 And yes, the Valerie Burton that she refers to as being enthusiastic about the upcoming EdCamp Louisiana is yours truly. 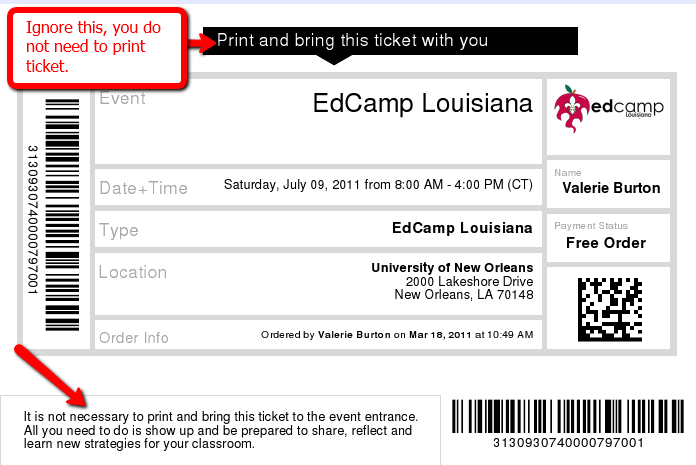 I can’t wait for EdCamp Louisiana. I can see it now… UNO’s campus will be loaded with 250 Professional Educators eager to share and eager to learn about what is going on in our classes. what is working and what isn’t working. We will not have the attendants sign up for sessions that they really do not want to take just to waste time until they can go to the sessions that they do want. The goal of the UnConference is to build the agenda around what the participants are interested in learning about. The UnConference is a series of ‘make and take,’ ‘share, reflect and plan,’ and ‘collaborate’ sessions. If you do not leave with new ideas, activities, plans, and friends we have not done our jobs properly. Thanks to all of those people who helped us make the concept of an UnConference in Louisiana a practical way to provide learning opportunities to our Professional Educators. I have created an event on Eventbrite. Eventbrite allows you to create an online flyer, a widget and e-ticket for your event. They have many different types of widgets available and you can customize the colors of your flyer. Click here to register for EdCamp Louisiana. The UnConference is the PD of the future. It allows teachers to create and deliver Professional Development Sessions that are of interest to them. It is teacher driven and directed. you really don’t need to bring the ticket. 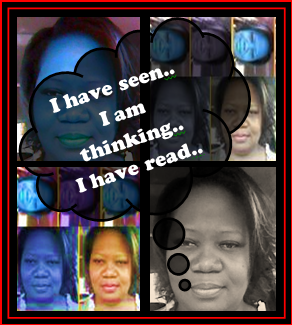 Posted on March 21, 2011 by Ms. B.. This entry was posted in 21 Techie Tchr Topics, My Head, My Presentations, My World, Personal Learning Network, Professional Development, Social Networking, Uncategorized. Bookmark the permalink.